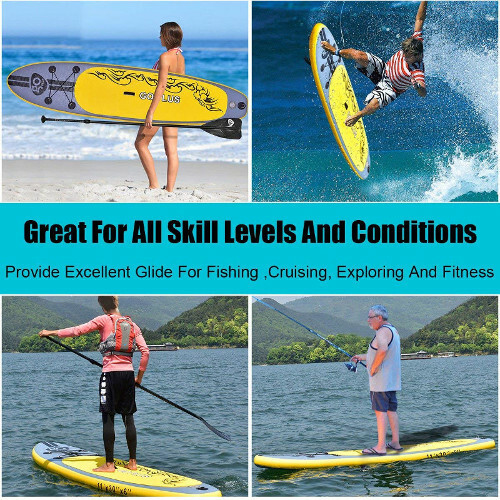 People look for different things since we all have different preferences and interests; however, it’s almost a given that any water enthusiast when looking for an inflatable stand up paddle board is looking for a board that’s durable, flexible and practical. GoPlus is here with us today with a very functional iSUP that’s designed for all skill levels and conditions. In this review, we’ll bring the GoPlus inflatable paddle board closer to you in an attempt to facilitate your quest to find your next travel/adventure companion. While looking for an iSUP, we all tend to take size and weight capacity into consideration because nobody wants to end up with a board that can’t handle them or a board they can’t handle. 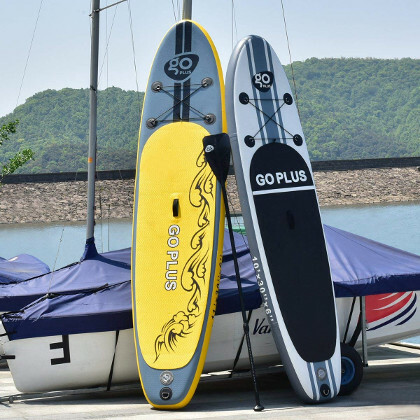 The GoPlus is an iSUP that’s on the medium size spectrum with two versions to it; the 10 feet long and the 11 feet one where both are 30 inches wide and 6 inches thick. This board is nicely built to be sharp and simple at the same time to simulate an authentic board’s design. And the fact that you get to choose between two different sizes is something highly appreciated when it comes to how much you think you want or can handle. The width and thickness factors here are just great; a large rider can stand, sit and lie down in complete comfort. It’s a roomy iSUP that can hold up to 265 lbs of weight without it submerging under water which can be translated into an adult and a pet or a child with some extra cargo. The GoPlus went big on the drop stitch material and technology to make sure their inflatable paddle board doesn’t defunct in the long run especially that an iSUP requires high pressure to be fully functional. 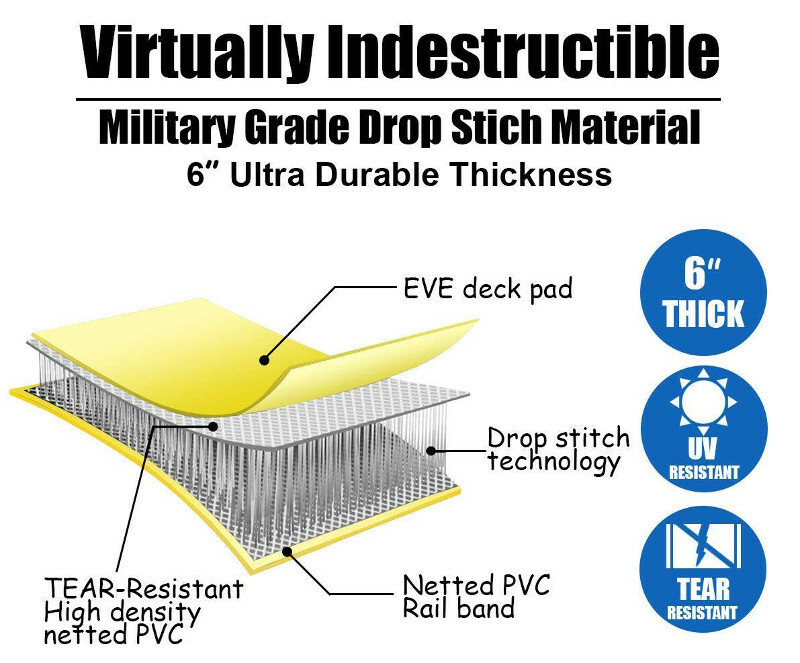 Also, the tear-resistant PVC material used on the outer shell of the board makes it quite durable; throwing the board around or bumping into things won’t matter really, you just have to be careful when it comes to really sharp edges or objects because that would ruin even the best of inflatable products. The body of this GoPlus paddle board is also UV-resistant which means this board will maintain its shape and color for a long time, and if you’re a friendly user, it might even last longer than you might ever thought. The first thing that makes a good iSUP is the traction pad. The GoPlus iSUP here is featured with a thick and soft EVA that adds greatly to its overall stiffness and rigidity. This pad covers almost 2 thirds of both versions’ backs and it comes in a different graphic design with every different color. Yes. 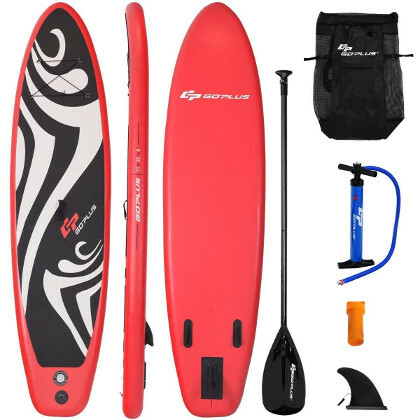 The GoPlus iSUP comes in 4 different colors; red, white (both are 10 feet long), blue and yellow (both are 11 feet long). What I’d like to point here is that the red board comes with a huge traction pad that nearly covers the whole back while the blue one is 32 inches wide which is wider than all the other versions. Also, the GoPlus is featured with a nice 4 D-rings storage area that’ll allow you to secure your paddle while taking a break, or take a meal-box with you so you don’t have to paddle your way back in order to have a snack. Actually; you can take anything you like with you once you wrap the bungee cord on it. A fifth D-rings is usually located on the board’s tail for safety leash attachment. Next, you’ll always find a central carry handle on inflatable SUPs because it allows you to transport the inflated board single handedly with minimum effort. This is of course one of the things that make an iSUP a lot easier to handle than many other options. Last but not least, GoPlus featured their paddle board with a trio-fin navigation system for maximum glide and smooth/straight water tracking. Only the large fin is removable to make folding the deflated board easier. A nice travel backpack where you can practically store and transport the board and its equipment. It’s mostly made of mesh material to make sure the board dries even when rolled up in the bag. A high pressure hand pump and a valve wrench. A package honestly can’t get any better than this; even some global brands don’t offer such a complete set. This is where everything gets real. The GoPlus board with its 2 versions (plus the blue board that’s 32 inches wide) deliver a neat performance and are capable of meeting all different riders’ needs. I personally was very pleased with how stable the GoPlus turned to be; as a person who’s used to paddling and who uses different iSUPs every now and then, it was quite easy to tell that this board is going to be great for entry level paddlers and intermediate ones. It’s very easy to control and navigate the GoPlus, and the fact that it’s designed for all skills and conditions makes it best suited for novice paddlers. The 3 featured fins help make the paddling motion as effortless as possible which means you’ll be moving fast; yet, comfortably. You can use the GoPlus iSUP in a lake or in the ocean; it’ll make no difference. It’s a versatile iSUP that can offer the best of both worlds. It can also be used for a variety of activities including Yoga, fishing, Surfing…etc. Number one pro is the complete all-inclusive package; nothing is missing. The GoPlus Surfboard is stable, fast and responsive. It comes in 2 different sizes; the 10 feet long and the 11 feet long. The Blue version of this board is 32 inches wide for maximum stability. The Red version is featured with a huge traction pad. This board is UV and tear resistant. It’s not a problem to me really; but some people didn’t like that this board has its dimension specs printed on the sides.